When you need personal loan in India, your research always starts with checking your eligibility criteria. As a salaried or self-employed individual, you can check your personal eligibility in no time online via various options available. 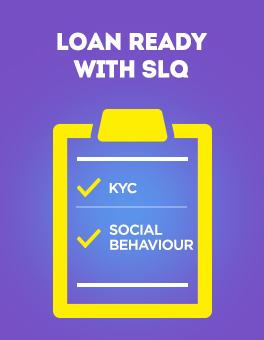 SLQ is India’s first social behaviour-based credit rating system for salaried professionals and young salaried millennials. While applying for a personal loan through a bank, we come across the term "credit score" which is determined in order to check the eligibility of a borrower for a loan. This score is calculated on the basis of past credit history and if one has not opted for any loan in the past, it becomes difficult to get one in the present. This process defies logic and is unfair for determining the creditworthiness of young professionals. Due to this, approximately 129 million have been deprived of credit due to lack of credit history. To overcome this shortcoming of lending sector in India, there has been a growth of instant loan apps in India. One such app is CASHe which has launched an alternate credit rating system – The Social Loan Quotient (SLQ). This uses modern technology combined with intelligent big data analytics, predictive algorithms to determine creditworthiness of users. There are millions across the country who have not ever applied for a bank loan but are active internet users who shop online, have a good social media presence, have a stable residential status and also have been using their mobile phones actively. The Social Loan Quotient will take into consideration multiple online and offline data points like his/her mobile, number of Facebook friends, public interactions on social media, social and media footprint, education, remuneration, career and financial history to calculate the borrower’s credit score. 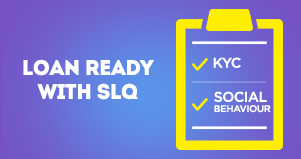 The SLQ score is generated in real time and enables the user to know whether he/she qualifies for a personal loan or not. This process takes just a few seconds after giving few required details. After the completion of the loan application process, every customer’s personal SLQ score is displayed to him/her. The SLQ determines both the loan amount and the interest rate charged. This will provide the user with a reliable tool for accessing his/her creditworthiness. The more the SLQ score, the better it is for the user in terms of interest rates the amount of loan that can be offered to him/her. All one needs to do is to download the CASHe loan app on your smart phone and provide RBI mandated documents like a copy of your PAN card, Aadhar card, latest salary slip, & last few months’ bank statement. The entire process can be completed in a very short span of time. The whole experience of borrowing money has been made extremely simple and convenient process. So, make sure to make the most of it.